The last few weeks I have been completing and quilting three 48×60 inch quilts for a veteran project for our local quilt club. 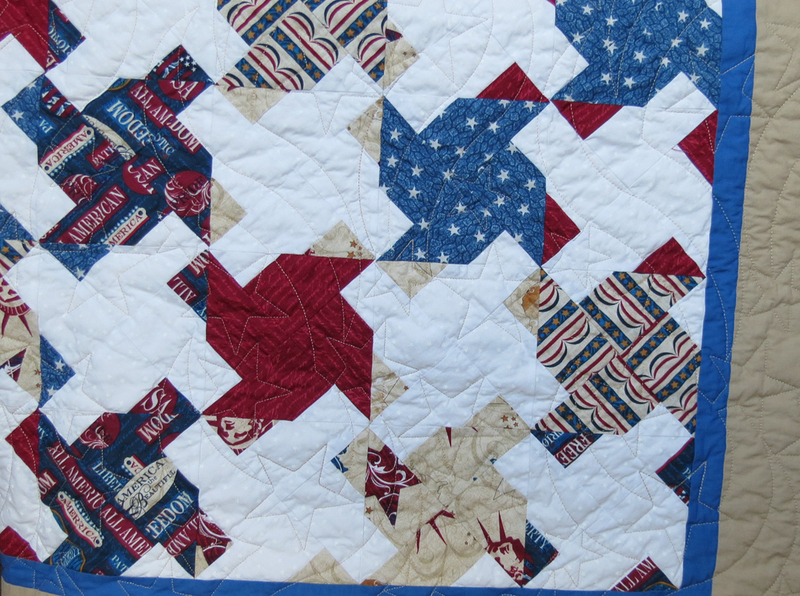 A few years ago the club decided to honor each veteran in the town with a quilt. Although a small town, there are a couple of hundred veterans from WWII, Korea, Vietnam, through recent deployments to the Middle East. The club has already given quilts to WWII veterans and the goal now is about 120 quilts for Korean, Vietnam, and other veterans. Did I mention the club only has about 25 members? After making and quilting the quilt, we wash the quilt and stitch on the label which will include the name of the recipient and that it is given by the club to honor them for their service to our country. 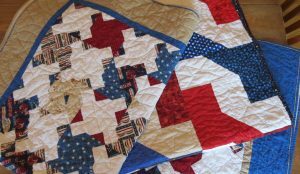 All of the quilts in any pattern are shades of red, white, and blue. 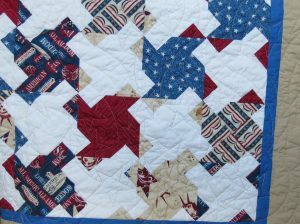 The club has a block of the month activity which supports our quilt efforts. Each month those participating make a r/w/b block or blocks. Whoever “wins” the drawing gets to take the blocks home, assemble and quilt the quilt. In addition, we have a couple of sit and sew days during the year to work on more quilts. Members are always welcome to make quilts on their own, too. Color Catcher sheets to catch fugitive dyes. White sheet shown below the box. 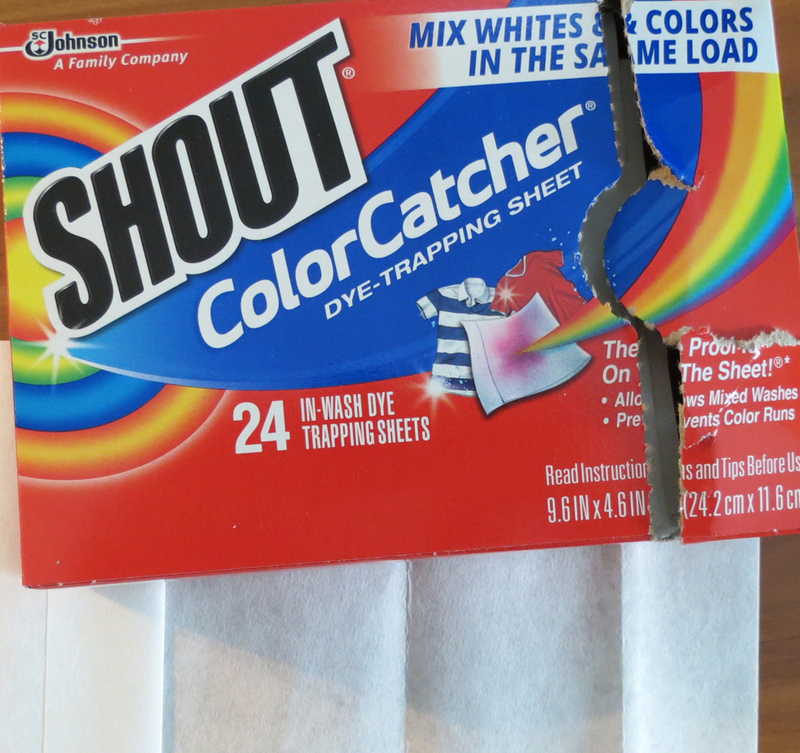 good idea to put a “Color Catcher” sheet ($5.29 for box of 24) in the washing machine with the quilts. The color catcher sheets pick up fugitive dyes released from the fabrics that would otherwise migrate to other fabrics in the quilts. A red to blue, or blue to red migration might not be very noticeable, but certainly either of those colors to white would show up. I am very glad that I put the color catcher sheets (2) in the washer as they both captured red dye and some blue. The quilts look fabulous with no evidence of any dye migration. Center color catcher with red and blue dye captured. Right color catcher before. Left color catcher with little dye as it got caught in the washer drum. migrates? Is the quilt ruined, or is there hope? 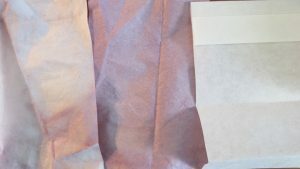 Because the dyes migrated once, they may still be unstable and able to be released from the fabric and “caught.” I found additional help from another blog post that offers several solutions and shows testing of several methods that can be used to try and capture the fugitive dyes from fabrics. Although there might be hope to capture the fugitive dyes after the fact, using color catcher sheets the first time fabric is washed is probably better. When I pre-wash my quilting fabrics (before making the quilt), I always toss in a couple of color catcher sheets. Because my two quilts were made with strips, they were not pre-washed. 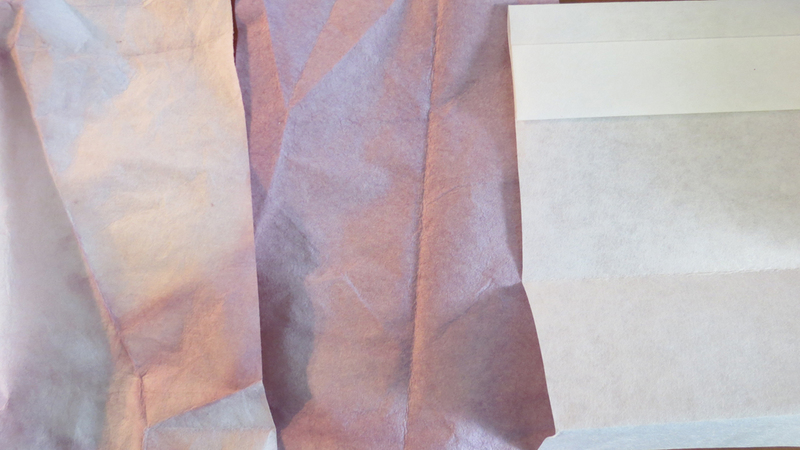 As a result, it was very important to capture any fugitive dyes during the wash using the color catcher sheets. If little or no dye was released during the wash, great! At least I was taking preventative measures just in case there were fugitive dyes.